are largely preventable and often reversible with a low-fat diet full of fruits and vegetables, perhaps one day they'll come to see a connection to mental illness as well. Because she's had trouble battling cravings and emotional issues, Victoria has not been able to stay on a raw food diet for a lengthy period of time, and so normally wouldn't be included on my success stories page. But what she's experiencing is so incredible and the ramifications are so large that I think her victory, even if inconclusive, has to be shared. Her ability to turn the voices in her head on and off like a light switch merely by going back and fourth between cooked and raw foods has the power to change the way the world looks at mental illness. Victoria's life has not been a happy one, but her future is looking up, and I'm glad she's agreed to share her story with us. 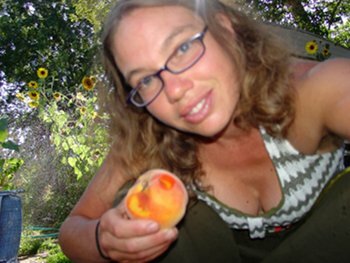 For those not interested in Victoria's long background story, you can skip to reading how she's turned off the intrusive voices in her head with raw foods here. This interview was conducted in February of 2011. Andrew Perlot: Tell us about your life and your experiences with Schizophrenia. What were the symptoms? How did people treat you? How would you describe your diet while suffering from the disease? Victoria Everett: It started off and on when I was 12, which was the same time that my health started going bad with irritable bowels and right after I started menstrating. I was a very happy outgoing child until I suddenly became depressed at 12. I grew up eating primarily junk food. I never really ate fruit and vegetables, although I loved eating canned peas and green beans. A serving of fruit in our house was considered a piece of apple pie or those hostess fruit pies, which, of course, don't really have fruit in them. By the time I was 12 I'd became more withdrawn. I would sit by myself in the hallway at school during lunch, and these voices in my head would be telling me that I was bad and no one liked me. I didn't understand what was happening to me and I didn't really have anyone to talk to about it. My mom and dad had a lot of problems and ended up getting a divorce when I was 14, so they couldn't really be bothered with anything going on with their kids. My friends didn't know what to do at first. They would come up to me and try to get me to do things with them, but the voices would tell me they were really out to do me harm, so I would tell them to leave me alone. Eventually they all went away. After that I switched schools a lot and had a hard time making friends. The voices became really bad when I was in the mid to late teens. I was also extremely tired all the time. I would sleep 10 hours a night and have to take an hour or two nap after school every day. My menstrual periods were horrible. I would have horrible cramps and literally took handfuls to ibuprofen to make the pain go away. My bleeding was so heavy that I would soak through an entire pad in less than an hour. I was always getting blood on everything, and it was awful to deal with. Despite all of that I always got really good grades at school. Reading and doing school work helped keep me focused and kept the voices quieter. I remember getting a job at McDonald's when I was 16, and that was when the voices became really bad. There were several times in my teens and early 20s that I attempted suicide. None of the attempts ever ended with me in the hospital, though. I also grew up with a mom that attempted suicide several times. I never had any clue that the voices in my head could be diet related and I never told anyone. I saw what happened to people with schizophrenia, and I didn't want to end up institutionalized. 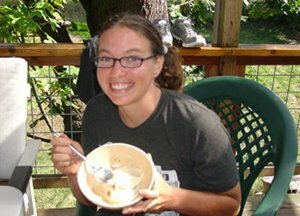 Victoria Everette in 2007, prior to starting a raw food diet. Victoria Everett: At 15 I was living with my dad when he beat me one night when I was freaking out and throwing things all over. He kicked me out of the house and I went to live with my mom. I few months later my step dad also beat me and kicked me out, so at 16 I was on my own. I worked, payed rent, and went to high school, which I find pretty amazing considering all the turmoil that was going on in my mind all the time and the lack of parental support. I got married when I was 19, a year after I graduated high school. I married the first man who was willing. I was raised with the mind set that you were supposed to get married young and have babies and then live happily ever after...haha. My husband never knew about my schizophrenia but I'm sure he remembers how crazy I was. I would do strange things like hide in the closet for a day until he would find me or start screaming and crying for no apparent reason. He was a very mentally abusive and controlling person. I knew he would put me away for good if he knew what really went on in my head. When I was 21 I had my first child. It was very overwhelming to me. I didn't know how to be a mom and it was pretty scary, plus I was still so young. When my son was born I had postpartum depression and the voices were really bad. There were several times I thought seriously of killing my baby and myself. Thankfully, I never followed through with those thoughts. When I was 23 I had my second son. When he was 3 months old I got a divorce. Going from a stay at home mom back into the work force with two little kids was very, very hard. I was seeing a guy at the time who recommended I go talk to his counselor. Andrew Perlot: What kind of treatments did you receive through conventional medical channels and how did those treatments affect you? Victoria Everett: I met with a counselor for the first time at the age of 23. I had very little money, and I worked delivering pizza and took care of my two young children. This counselor, Maggie, specialized in battered women. She told me I could pay her whatever I could afford and actually saw me for free for years. After seeing Maggie for a while I never told her about the voices but I told her about being depressed. She convinced me to try anti-depressants. I was very much against the idea and I didn't want to be drugged. I wanted to be able to make myself better on my own using my own inner strength, but I finally said I would try anti-depressants and see how they worked. I started taking Prozac and it helped. I felt less depressed, and actually felt so much better I decided to enroll into school at Boise State University. I started going to college while still working and taking care of my boys. It was a tough schedule but I felt like I could handle it, and I did. I felt much better for about a year. The voices were not as bad, I didn't feel as depressed, but it was still a problem. I was really loving school, but gradually the voices and depression started getting worse again. They just gave me more Prozac, and that worked for a few months, but then everything would come back, a process that repeated itself about every six months. Victoria Everett: I "accidentally" became pregnant when I was 27. The pregnancy was really tough because I was sick the whole time. The guy I was with was lazy and wouldn't work. The Prozac wasn't helping anymore but I didn't want to up my dose again because I was pregnant. Before my pregnancy my health had been deteriorating anyway. My irritable bowels were worse than ever. I had chronic diarrhea every time I ate, and of course almost every meal was fast food. I had heart burn a lot, I had chronic fatigue, and I felt like I couldn't get enough sleep. My muscles and body ached all the time and I was constantly getting bronchitis and bladder infections and being given antibiotics. I also had nonstop ear pain during the whole thing. Somehow I survived that pregnancy, but It was nine months of constant vomiting and feeling nauseous every minute of every day. I'd gained a lot of weight during the pregnancy, and afterward it stayed on. The Prozac wasn't helping the voices or depression at all anymore, so they switched me to Effexor. At first this seemed to make everything worse, but the doctor assured me that after about 6 weeks my body would adjust...and it did. It helped for a while just like the Prozac but only for a while and then I would have to take more. Around this time my joints started to become arthritic, I developed fibromyalgia, still had chronic bronchitis, bladder infections, and diarrhea. I thought maybe doing the newspaper routes 7 days a week was too much, so I quit and put up fliers around town for house cleaning. I got a few jobs and business picked up right away. Before I knew it I had a full schedule. I was working less hours but I was still just as tired and the physical labor was hard on me. I lived on ibuprofen. I took a handful of it almost every day. Victoria Everett: My oldest son was 11 at this time and told me that he wanted to stop going to the babysitter and thought he could watch his brother and sister while I worked and went to school. I was a little bit leery about this, but told him it would be ok when I would only be gone for an hour or two. I thought this was going good until my second son's best friend's mom called me one day and told me that my oldest son was molesting my daughter. The boys had done some things to my daughter one day when her son was over there and her son had told her about it. I was horrified that this could be happening. I talked to my boys and they admitted to doing some touching. I put all the kids into counseling and ended the babysitting sessions. About a week later health and welfare came to my house, took my sons away and put them into custody with their dad. I was devastated. I was allowed to see my boys once a week for 8 hours. My daughter was not allowed to see her brothers for 2 years. I went into a severe depression. I quit school...30 credits away from graduating....only to be told that I couldn't come back until I payed off my student loans. I cried non stop for weeks. I would cry all day at work and come home and cry all night. A friend came over one day and talked me into smoking some marijuana. He said it would make me feel better, so I tried. I loved the way it made me feel. I was hooked. It also seemed to help with all the pain my body felt and quieted the voices in my head. I started smoking marijuana all day every day. 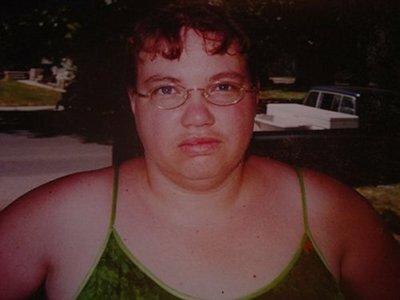 Victoria Everett: So here I was smoking cigarettes and marijuana, eating a fast food diet, chugging Pepsi and ibuprofen, taking a very high dose of anti-depressants, weighed 250lbs., mourning the loss of my boys, and somehow I was getting out of bed everyday and going to work. Freaking amazing! At the age of 34 though my body was pretty much done. I felt sicker and sicker all the time. Every single part of my body felt like it hurt every minute of every day. I kept going to dr.'s saying that I was sick only to be told over and over that it was all in my head. Finally one day I went to the emergency room because my stomach was in so much pain. They did an ultra sound and found that my gal bladder was full of stones. Finally someone believed me! So they scheduled for me to get my gal bladder removed. I was so happy. Once that nasty thing was out, I was convinced, I would be just fine. This was why I had been feeling sick my whole life...it was my gal bladder. I find it interesting that never once was I told that I could lose some weight, stop eating fast food and chugging Pepsi and then maybe I might feel better or maybe I could even save my gal bladder. So out my gal bladder came in November of 2006 at the age of 34. Once it was out I didn't feel any better. I actually felt worse. By this time I was in full panic mode. I knew I was dying and I wasn't ready. I kept calling the surgeon and talking to the nurse telling her I was still sick. She suggested I drink chicken broth, or eat toast. Nothing seemed to help. Finally she told me that some people have problems for up to a year after gal bladder surgery and that I should call back then if I am not feeling better. I didn't know what to do. I could barely even get out of bed. I was laying in bed a few days later stoned to the max and this infomercial came on the television. It was a guy named Kevin Trudeau, he had a book called "Natural cures they don't tell you about". What he was saying made sense and even though I knew it was probably a scam I was desperate and besides I was dying so who cares. Andrew Perlot: What first turned you onto the idea that diet could be used to treat your mental illness? Did any particular books, researchers, or acquaintances tip you off? Victoria Everett: So Kevin Trudeau's book got me started. It talked about how bad food is with all the preservatives and chemicals put in them. It also said to eat more fruits and vegetables. He said to eat everything organic, even though he still promoted eating meat and dairy, this still got me thinking. I stopped eating fast food and started cooking organic meals at home. I started to feel a little better but not much, though it was just enough to make me realize that food could change the way I felt. Something I was oblivious to before. Shortly after this I came across a really short article about raw food. It just talked about raw food and living enzymes. I thought to myself that maybe I wasn't producing my own enzymes and that was my problem. So I ate all raw fruits and vegetables for one day. I immediately felt better than I'd felt in years. I would eat raw fruits and vegetables for a few days, but then I would be so hungry I thought I would starve to death so I would eat some cooked food. I would immediately feel awful after my cooked food meal. I couldn't figure out how to make this work, so I went back and forth for a while. Finally I was tired of feeling bad and decided that I was going to eat all raw, but I would eat as much as I wanted until I wasn't hungry anymore. So that is what I did. I would sit down and eat half a watermelon, still feel hungry, grab the other half and eat that. I didn't know that this is what is recommended to get enough calories. I was just trying to stay alive, and didn't know about food combining, natural hygiene, or anything about health. I was just surviving. I ate and ate and ate, more than I'd ever eaten, and I kept loosing weight and feeling better and better. I did this for a month or so, quit smoking cigarettes, was feeling amazing. Every single affliction that I had suffered with many years and years was gone. They just vanished. My periods were painless and not near as heavy as they had been. For the first time that I can remember since I was 12 the voices in my head were entirely gone. My thoughts were clear, pure and all mine. So I quit taking my anti-depressants cold turkey, which I would never recommend. I went through three months on horrible drug withdrawals. Victoria Everett: It was around this time when I met some other raw food people. I didn't know these people even existed before...how exciting! So I started going to raw potlucks and then I learned how to mix nuts and seeds, soak them, make pizza, make brownies...eat all the food I used to eat but this way I thought they were good for me. Wow! that's even better! I could have my nut cake and eat it too! So I ditched the fruits and vegetables and dove into high fat raw. What fun that was. I literally lived off of guacamole and raw brownies. Life was good....until I started to feel sick again and the voices came back. I couldn't figure out what I was doing wrong. I had read David Wolfe's book, and I was eating 100% raw. I didn't understand what more I could be doing. If I couldn't eat cooked and I couldn't eat raw than what could I do? 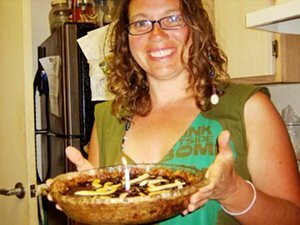 I was co-teaching a class with a friend about how to prepare and eat raw food, and I felt like a fraud. I was telling these people this was the best diet in the world and yet it was not working for me anymore. I felt I had to be honest and told the class that I had just recently started struggling on this diet. There was a lady in the class named Michele Martinez. She told me she was reading a book called 80/10/10 by Dr. Doug Graham and she thought that maybe it was the fats in my diet that could be causing my problems. I read the book and a light went on. I remembered how I felt when I first went raw. I was eating all fruits and vegetables because that was all I knew to eat. I felt great at that time, then when I started doing the raw gourmet was when I started having problems. I switched back to raw fruits and vegetables and once again I immediately felt way better. The voices were gone again and my body felt great. Andrew Perlot: Tell us about your journey from schizophrenia to a more healthy state of mind. What dietary and other changes did you make to get there? What state is your mind and body in today? Victoria Everett: So I was low fat raw vegan for a month or two. I felt like i was on top of the world. I was down to 130lbs. I rode my bicycle everywhere and loved it so much I got rid of my truck. I was invincible...ha! One day I had a tiny bite of some cooked wheat berries with chicken broth. That one bite brought back all my old food addictions. I wanted my old foods back, they were full of memories and comfort. I had no memories associated with fruits and vegetables. I never ate them much growing up. So slowly, over time, I started eating cooked food. I would eat all low fat raw and then have something cooked for dinner. Sometimes it was just plain rice, but more and more it got to be vegan pizza or even a little bit of cheese here and there. I found I could play a balancing game. If I was careful I could get away with eating a little bit of cooked food. I didn't feel too terribly bad and the voices were really quiet. Sometimes I would tip the scale a little too far and the voices would be loud and my body would feel horrible, especially my ears, but it was only for one day...here and there. I was still in control. I was also still smoking marijuana. It was better than other things If I was going to have an addiction. I also kept putting on weight. Just a pound here and there. Also during this time I was reading and reading and reading, book after book on health and nutrition, proper food combining, how to overcome addictions, and emotional intelligence. I would go low fat raw for a week or two only to take that one bite of cooked food and end up back in the roller coaster. I would quite smoking marijuana for months at a time only to take one hit and be out buying a sack the next day. I went to Dr. Doug Graham's Health and Fitness Week in the fall of 2010, thinking that was the key to getting back on track for good. It lasted two weeks and I lost it again. I came to Kauai to stay with Janie Gardener (ED: who eats a low fat raw diet) for a month. I was thinking...this is it...I'll get back on track now, a month of eating all raw and then it will be a habit. Well I lasted 2 days before I ate cooked food. That episode caused me to have a candida outbreak. I ate raw for 3 days until the candida cleared up. Victoria Everett: I have now been raw for over a month. This is the longest I've gone since switching from high fat raw about 2 years ago. I feel very strong in my eating habits right now. Staying a month in Kauai with Janie really helped me a lot. I have no desire to stray and the cravings for cooked food are gone. I feel differently this time though. I just decided that I am going to do it no matter what. Emotions come up...bring them on! Cravings happen....that's ok...but I'm not giving in. I don't eat enough calories and get super hungry...well then I guess I better get some fruit in me pretty darn fast. I was feeling frustrated for a long time, feeling like I was going backwards and not making any progress forward. I now see that I was still going forward. There were addictions I needed to work out, emotions I needed to process, knowledge I needed to gain. That has been the past two years of my life. Andrew Perlot: Do you believe that there's one particular issue that caused your schizophrenia? I notice the symptoms are the worst when I over eat fats. Breads also bring on the voices but not as bad as the fats do. Also preservatives bring the voices up as well. Andrew Perlot: How long does it take for the voices to disappear when you start eating a low-fat diet of fruits and vegetables? Andrew Perlot: What might you eat on any given day, including calorie count? Victoria Everett: I try to eat at least 2,500 to 3,000 calories a day. Yesterday I ate 70 oz. of fresh squeezed tangelo juice, some rambutan, a couple of caimito's, 2 liters of papaya/banana smoothie and a bunch of katook (a yummy green leaf). I actually felt like I under ate on calories yesterday. I woke up hungry in the middle of the night. I will be sure to eat more today. Andrew Perlot: What is the reaction of the doctor(s) who had been treating you when you told him or her that you were successfully treating your Schizophrenia through diet? What was the reaction of your family and friends? Have you tried convincing others with mental illnesses to follow a similar path? Victoria Everett: I did not tell my doctor, since I don't have one anymore to tell. I just recently came out to my family and friends about my schizophrenia. My family didn't believe me and my friends have been very supportive. Andrew Perlot: Schizophrenia is but one mental disorder among many. Do you think some or all of these could be addressed through diet? 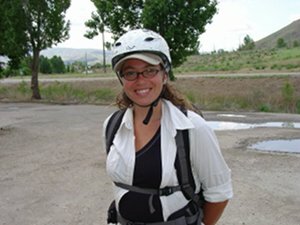 Victoria Everett: I believe that all mental disorders such as depression, bio-polar and schizophrenia are diet related. I can't say about mental retardation or autism, those I have not studied them much and have not experienced them with myself or first hand with others. 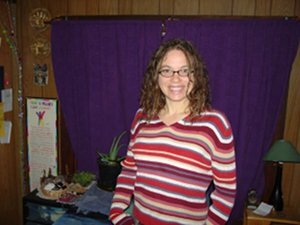 Learn about the healthy raw food diet that's improved Victoria Everett's life so much. Read more inspiring raw food diet success stories. Find out which diseases reverse themselves on a raw food diet.